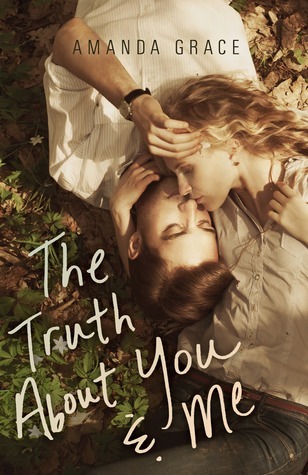 The Truth About You And Me by Amanda Grace is the second book that I've read this year that dealt with the uncomfortable topic of a student-teacher romantic relationship. This book tells this story from the perspective of Madelyn as she tries to explain in a series of letters to her college professor, Bennet, just how this misunderstanding about Madelyn's age occurs and she tries to explain how everything happened and also apologise for her deception. It was an interesting story, this one. Right from the start, we know that by the very nature of Madelyn's letters that theirs is a relationship that was found out. Even so, Madelyn walks us through every glance and every smile that leads up to this untold but presumed shocking ending. I could see the genuine attraction and sweet build-up of this forbidden relationship and at times I wanted to root for Bennet and Madelyn as a couple because of how cute they are together, but I couldn't. In the end, the idea of Madelyn witholding her age from Bennet for so long was a little bit too selfish for me and because of it I couldn't fully sympathise with her reasonings. At times, I felt pretty bad for Madelyn. I could understand how her family's expectations have put pressure on her and how those expectations feel incredibly restrictive. I could see through Madelyn's explanations part of the reason why she makes this decision to carry on with Bennet romantically. It's a form of rebellion to everything her parents expect from her. And Bennet, of course, plays his part in wrongdoing. Still, he does try to limit the damage but not beginning anything before the term finishes, not knowing that Madelyn has always been years younger than he though. I was really disappointed that inward accepted for this on NetGalley as I strangely love student-teacher relationships! Glad you enjoyed it! I'm kind of drawn towards student-teacher relationships too after this and The Drowning Instinct. It's interesting.